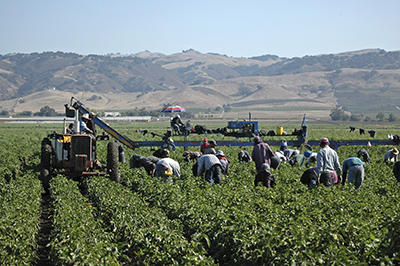 My colleague Preston Huennekens recently posted on the concurrent introduction in both the House and Senate of bills to grant amnesty to hundreds of thousands of alien agricultural workers. The bills were introduced in the two chambers, respectively, by Rep. Zoe Lofgen and Sen. Dianne Feinstein, both from California. There's something deeply amusing and ironic about the notion of these two liberal Democrats catering to Big Agriculture in such a flagrant manner. But I guess even Democrats have to worry about keeping the coffers full for their next reelection campaigns. I don't much like temporary guestworker programs of any kind; they depress wages and cater to employers' bottom lines rather than to the needs and aspirations of American citizen and resident workers. But agricultural programs tend to be even worse, because often enough the aliens who are employed in them (or who simply work in agriculture without any legal right to be in the United States) work in conditions of near-peonage or are subjected to unhealthy living conditions in which they sometimes even bathe in pesticide-laden runoff water filling the ditches near their encampments. And you sometimes see them sitting in rows on buses on the highway, being transported from site to site like prisoners being moved from one institution to another. But the ultimate irony of this amnesty is that only a fool would think aliens who become the happy recipients of so-called "blue cards" would continue working in agriculture, knowing the abysmal conditions that so often prevail. They may be uneducated and sometimes of limited skill sets, but they aren't stupid. They will promptly go find gainful employment in some other sector of the economy ... leaving those quarter-million jobs allegedly critically needed by agricultural employers once again vacant and waiting to be filled by more temporary guestworkers. And so the cycle continues.